It was a volatile week with oil prices climbing slowly on Monday and Tuesday, falling by over $2 a barrel on Wednesday and Thursday, and then rebounding to close down about 50 cents for the week on Friday. As has become normal of late, the up days were largely driven by expectations of increasing demand and the down days by fears of a shale oil glut. New York oil has been bouncing around in the low to mid-$60s since mid-January while London futures have been trading some $3-4 higher. CERAWeek: The news last week was dominated by the CERAWeek conference in Houston put on by IHS Markit that was attended by some 4,000 leaders of the global energy industry. With numerous oil ministers and CEOs giving presentations and holding news conferences, headlines were constantly made. As could be expected, the heart of the meeting focused on the OPEC/NOPEC production cut, the second wave of rapid growth in US shale oil production and the looming global supply crisis as the investment in finding new oil is not keeping pace with increasing demand. Nearly all the participants were happier this year with oil prices in the mid-$60s as compared to recent years when they were considerably lower. OPEC leaders meeting with US shale oil executives to search for common ground that would support prices. Former EIA director Sieminski suggesting that there could be a “decade of disorder” ahead for the oil industry. The impact that large reductions in industry capital expenditures during the three years will have on the oil supply in the next decade. The future of the OPEC-Russian alliance to push up oil prices. The IEA hype about the future of the US shale oil industry continued with the Agency announcing that US crude production is expected to reach a record of 12.1 million b/d in 2023, up about 2 million b/d from this year. Last Monday, IEA released its medium-term oil market report which said that after falling by 600,000 b/d in 2016 and 200,000 b/d in 2017, US light tight oil production could climb by about 250,000 b/d in 2018 as the global market begins to rebalance. US shale will see year-on-year growth of about 550,000 b/d within five years as prices recover and technology improvements boost well production rates. Amidst all the euphoria there were one or two contrarian opinions expressed. Hess CEO John Hess said, “As an industry, we’re not investing enough for supply growth to keep up with demand growth,” Hess said. Hess also said that decreased investment throughout the world, particularly in the offshore, will likely cause supply to plateau or drop as demand continues to rise. The supply crunch will likely hit in three to five years. Mark Papa, the former CEO of EOG Resources, says US oil production will not keep growing as fast as the market seems to think, as most of the best drilling locations in North Dakota and south Texas already have been tapped. He believes shale is not an all-powerful disrupter of oil and gas markets as has been portrayed, and strongly takes issue with the consensus that U.S. production will swamp global supplies and perpetuate lower prices. The OPEC Production Cut: According to Platts, OPEC February crude outputs fell by 70,000 b/d to 32.39 million. The February output figure was 340,000 b/d below OPEC’s notional ceiling of about 32.73 million b/d. Much of the decline was due to Venezuela’s continuing decline to what Platts says is 1.57 million b/d. Perhaps the most interesting news last week was the IEA’s prediction that the US will cover 80 percent of the world’s increased demand for oil over the next three years. Canada, Brazil, and Norway are to cover the remainder, leaving no room for more OPEC supply. The IEA’s report paints a gloomy picture for OPEC members, who are hoping to phase out their supply cuts after this year. With non-OPEC supply rising quickly, OPEC may have trouble figuring out a way to increase output without pushing down prices. The cartel may keep the production cuts in place for longer than they had wanted, but doing so would mean ceding even more market share to the US and other non-OPEC producers. According to the UAE’s oil minister, there has as yet been no discussion about extending the production cut into 2019. US Shale Oil Production: While last week was dominated by the IEA’s prediction that US shale oil production will continue to grow rapidly, a few voices are expressing concerns. Simon Flowers, Chairman and Chief Analyst at Wood Mackenzie, said late last year that signs have started to emerge that the relentless intensification of drilling leads to diminishing returns. Pumping twice as much sand as usual into Permian wells and drilling longer laterals don’t deliver commensurate volumes of oil. “Drilling costs rise exponentially with depth, and there’s a suspicion that longer wells are hitting a cost efficiency ceiling.” How this will sort out in the next few years is difficult to foresee. While more sand and longer laterals will yield more oil upfront, many are saying that the additional costs of getting the oil out quicker will catch up with drillers in 2-3 years when the “new technology” wells dry up sooner without producing enough oil to justify the added costs. 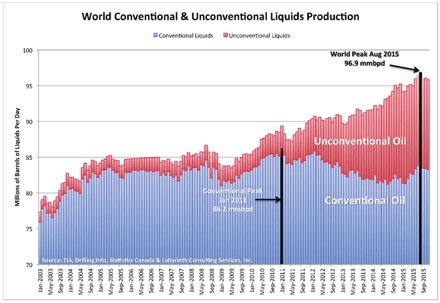 While higher levels of shale oil production may be easy to attain, the problems will begin when the “sweet spots” are gone and the demand for more and more new output to offset the rapid depletion of the older wells is no longer possible. Iran: Iran’s crude and condensate exports seem likely to fall to a two-year low in March as exports to its main Asian buyers will be down by one-third from February. Compared to a year ago, March exports will be down 26 percent. This drop is occurring despite Tehran’s efforts to entice customers, including reducing selling prices and offering to raise the freight. Concern over continuing sanctions is believed to be behind the decline. Japan, Asia’s fourth-biggest buyer of Iranian oil, will not import any Iranian oil this month, the first time since March 2016, amid uncertainty over whether insurance for tankers carrying Iranian oil would be extended beyond the end of the month. Despite expectations that the Iranian oil industry would grow rapidly after the lifting of the sanctions, little has happened. International oil companies are concerned about the Trump administration ripping up the nuclear agreement and re-imposing some form of sanctions. Iranian officials were hoping the nuclear deal would result in $10 billion a year in fresh foreign investment in Iran’s oil and gas sector but only about $1.3 billion has been invested, mostly from China. Tehran’s oil-production capacity has plateaued at 3.85 million b/d, according to the International Energy Agency, far below the estimates made by Iranian officials when the sanctions were lifted. France’s Total signed a $1 billion deal in November 2016, but this remains the only western investment announced so far. The government of Iran imposed new restrictions on the use of the US dollar in the country. Starting on February 28, any supply orders or other import declarations where US dollars are used will not be processed by the Iranian customs authorities. The new rules should not affect current trading operations very much, given that the use of the American currency in Iran was already limited. Iraq: Iraq’s Parliament voted last Monday to resurrect the Iraq National Oil Company (INOC), three decades after it was merged into the Oil Ministry by Saddam Hussein. If implemented, the law could fundamentally restructure Iraq’s oil sector: INOC is slated to take over key operational responsibilities from the Oil Ministry and report directly to the Council of Ministers. The oil ministry said that Iraq produced an average total of 4.36 million b/d of crude in January, down just 2,000 b/d from December, and putting it just above its OPEC cut obligations. The total includes production from the Kurdistan Regional Government, which the oil ministry estimated at just 136,000 b/d. After Kurdistan’s independence referendum, Iraqi forces seized the oil fields around Kirkuk, which had been under Kurdish control since 2014. Two weeks ago, Baghdad and Erbil agreed to a tentative deal to restart full oil flows from Kurdistan, but few details about the deal were announced. The two have yet to settle their dispute over oil revenue sharing, who will pay Kurdistan’s debts, and how much money Iraq will transfer to Kurdistan from its national budget. The IMF is supporting the objections raised by Erbil over Iraq’s 2018 budget – a dispute that now threatens Baghdad’s ability to access billions of dollars’ worth of international loans. The budget, passed by Parliament, concerns the IMF for two reasons: not only does it allocate just $5.6 billion to the Kurdistan Regional Government (KRG) – a steep cut compared to previous years, but it also lowers taxes and reduces non-oil revenue. Saudi Arabia: Crown Prince Mohammed bin Salman’s current trip to Britain and the US could shape the decision on where to list oil giant Aramco. Sources say the chances of London and New York hosting the IPO appear to be receding. Hong Kong is emerging as a likely compromise because Riyadh wants to help Asian nations that are expected to become “cornerstone” investors, including China and Japan. The Saudi energy minister is saying the decision has been pushed back to 2019 and some observers believe that the sale will never occur, or will be scaled back to a listing on the Saudi domestic stock market. The Saudis plan to use surplus oil revenues to bolster the financial firepower of its $230 billion Public Investment Fund, the sovereign wealth fund being used for economic modernization efforts. Should oil prices exceed the level required to balance the Saudi budget, any extra revenues would be funneled into the fund. The kingdom’s minister of economy and planning said “Whenever oil is above our break-even point the surplus will go to the fund,” without disclosing the level at which the fiscal balance is zero. Libya: The National Oil Corp. declared a force majeure on crude deliveries from the 90,000 b/d El-Feel field on February 23, after it was shut and staff evacuated due to protests by local tribes and guards. However, last Wednesday the dispute was apparently settled and staff returned to work. If the dispute is indeed over, Libyan crude production could bounce back to circa 1 million b/d. China plans to create an energy ministry to oversee the country’s oil, natural gas, coal and power sectors as part of a shake-up aimed at making policymaking more efficient. The move comes in the wake of the debacle earlier this winter when many buildings in northern China were converted from coal to natural gas without sufficient natural gas supplies available. The new ministry will not be part of the National Development and Reform Commission which supervised the old National Energy Administration but will handle energy-related issues that are currently the responsibility of several government agencies. The move signals China’s acknowledgment of the many issues the country faces as it tries to clean up its air at a time when domestic oil and natural gas production is declining. To sustain a 6.5 percent rate of economic growth, domestic coal production in 2018 is planned to reach an all-time high at 3.7 billion tons, up 7.3 percent from last year. How this helps with the air pollution problem remains to be seen. The government, however, says it will cut its coal consumption to around 59 percent of the nation’s primary energy mix while raising natural gas consumption to 7.5 percent of the mix in 2018. It also aims to cut coal consumption to just half of its energy mix by 2020 by raising output and demand for renewable fuels. The country hopes to produce around 160 billion cubic meters of natural gas this year, a record and up 8.5 percent from 2017. Officials from China’s two largest oil and gas producers have urged the government to offer tax breaks for the building of gas storage facilities and importing liquefied natural gas (LNG) to help avoid another gas crunch next winter. China’s increasing demand for imported natural gas became evident last week when the most recent LNG import figures were released. In January, China imported 5.18 million tons of LNG, a new record, compared to the previous record of 5.03 million tons set in December. If there is an LNG glut, Beijing will soon soak it up. The Chief of the International Energy Agency said at the CERAWeek conference that China will continue to be a main driving force for the growth of global oil demand. The European Union has been trying to diversify its gas supplies away from Russia, intensifying these efforts after the gas war between Russia and Ukraine in 2010 that led to supply outages in Europe. This gas war has flared up again in recent days after the Stockholm Court of Arbitration ruled in favor of Ukraine’s Naftogaz, slamming Gazprom with a more than $2-billion bill. Russian Energy Minister Alexander Novak said Moscow should speed up work on gas export pipeline projects to Europe due to tensions with Ukraine over the transit of gas. Russia has plans for two more pipelines—Nord Stream 2 and Turkish Stream—and the EU is building the Trans-Adriatic pipeline that would supply gas from the Caspian Sea to the continent. The Trans-Adriatic line is still several years away from completion, and until then the EU is dependent on Russia. Even though LNG supplies are an alternative for Europe, Russia’s Yamal LNG terminal is closer to Europe than any other supplier’s facility. The UK received two Russian LNG cargos this week after the “Beast of the East” cold spell engulfed Europe. Russia’s first deputy minister of energy Aleksey Texler said at the CERAWeek last week that Russia sees no reason to join OPEC, but the need to continue the OPEC/non-OPEC cooperation in some form after the production cuts end is obvious. The International Energy Agency warned in its 2018 oil report that Angola’s oil fields are maturing and are nearing depletion and that unless new investments are made the situation will continue getting worse. Angola’s oil production could drop to just 1.29 million b/d over the next five years. Currently, the country pumps around 1.63 million b/d. Angola was once a magnet for the world’s biggest oil companies, drawing billions of dollars in investment; however, energy companies have reduced capital spending in Angola more than in any other sub-Saharan African country, with an estimated $67 billion in spending cuts from 2015 to 2020. More troubles are coming from the heavy rains, filthy conditions, medicine shortages and endemic corruption that have combined to increase malaria across Angola. Since the start of the year, more than 300,000 cases of the disease have been reported, leading to at least a thousand deaths. Experts say this is a clear sign of the poverty and failings of governance in a country which, paradoxically, is one of Africa’s top oil producers. On the bright side, Total, which is heading the 230,000-barrel per day Kaombo project, said the first vessel that will pump and store oil in Angola’s waters is on its way from Singapore right now. The $16 billion project is slated to cause a 14 percent jump in oil production compared to 2017 oil production, which stood at 1.63 million b/d. The floating production, storage, and offloading unit will be able to pump 115,000 b/d, half of the project’s final expected output. Offshore production is growing in West Africa as a way the international oil companies can avoid all the troubles of producing oil onshore. There is still no good news. Some 4,000 Venezuelans are fleeing to Columbia each day to avoid starvation, health services are collapsing, and there now is a critical shortage of blood. What the Trump administration will do is the center of speculation. There are reports that Washington is becoming more serious about imposing heavier sanctions such as Venezuelan oil imports or banning the export of the dilutants need to make Venezuela’s very heavy crude exportable. Most observers are saying that these additional US sanctions would collapse the country’s oil industry and lead to still more hardships for the people. Venezuela sends much of its oil to refineries on the Gulf Coast, but these shipments have fallen to 439,000 b/d in the week to February 23 from 654,000 b/d a year earlier. The reasons for the decline are lower production and worsening quality of the oil some of which is being rejected by US importers as too bad to refine. China and Russia have an interest in bailing out the Maduro government which is heavily in debt to both countries, but it is starting to look like bailing out Venezuela is beyond what these countries are willing to invest. The loss of Venezuelan exports from the world market would likely have a significant impact on prices by offsetting much of expected increases from the Permian Basin. While a collapse of Venezuela’s oil production would still leave the reserves, the country’s infrastructure, both human and equipment, is in such poor condition it will take large investments to restore. Latin America derailing: A new report from Verisk Maplecroft says that Latin America’s election “super-cycle” presents a series of potential obstacles for ongoing oil and gas development. Mexico may top the list of vulnerable countries, but voters are also heading to the polls in Colombia, Brazil, and Venezuela this year.